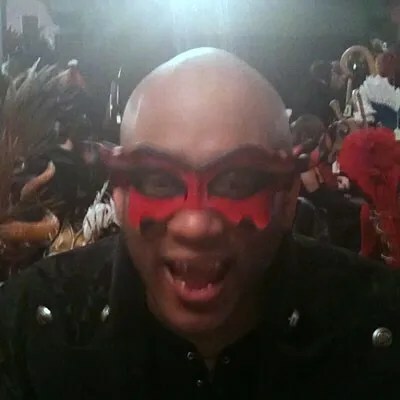 We traveled down to Portland Oregon this weekend to vend at the 9th annual Vampire’s Masquerade Ball. 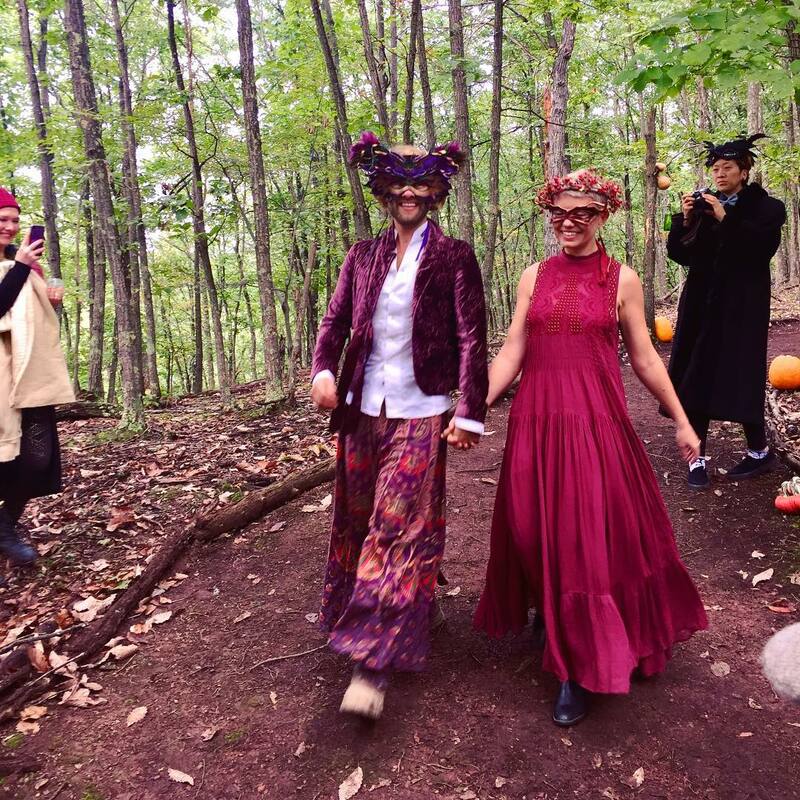 It was a fabulous experience — despite the fact that I had a raging migraine the entire evening, we had a blast! 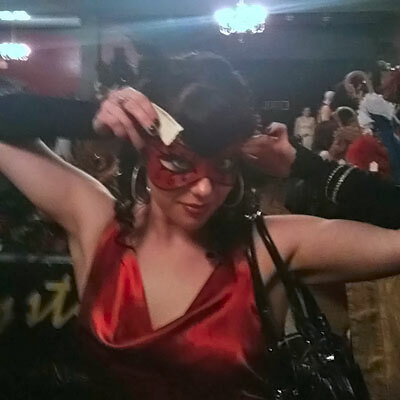 The show’s producer, Lady Raven really goes all out to create an elegant event. Her careful planning and attention to detail are evident everywhere you turn. The crowd was amazingly well dressed, colorful and friendly. I foolishly forgot to bring my good camera, so I’ve only got these blurry camera phone photos to share. Sorry about that, folks! Hopefully they at least hint at the elegant characters and vibrant costumes at this event. Oh! And I got to meet my fellow Fae Team member, Susan Tooker (of Susan Tooker’s Spinning Castle). I have long admired her amazing jewelry and costume design skills, so it was a real treat to see them in person. 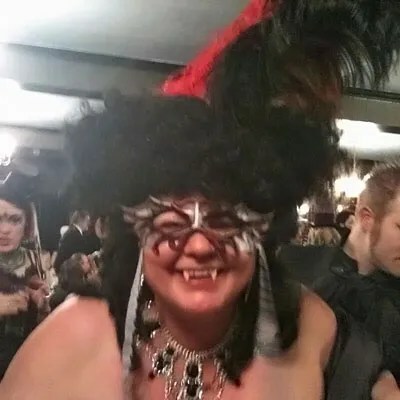 I wish I’d taken a photo of her (the vampire pirate to the left is not Susan) but the aforementioned migraine really put a damper on my thinking/social skills. 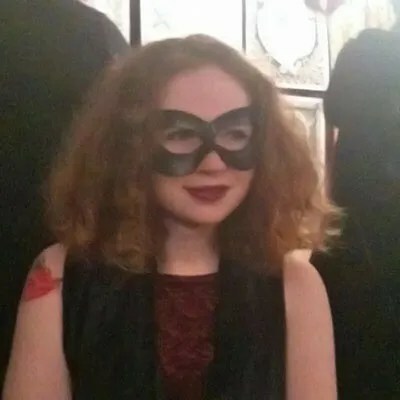 So, for now you’ll miss out on photos of Susan as a dark and mysterious faerie queen; however, we had such a great time at this show that I hope to make it down for more Oregon costume events. Maybe I’ll get another chance to connect with her and share some photos on this blog — in the meantime, do check out her store link above. You will not be dissapointed! Another very talented artisan that I met at this event was Laura of Taken by the Sky. She creates exquisite corsets and fantasy clothing. In getting ready for this show, I realized that R & I are in desperate need of new costumes! When we quit smoking, we both gained an absurd amount of weight and nothing fits anymore … I am working on losing the extra pounds, but of course it’s a slow process. I think I will set aside money for one of her cutaway pirate dresses (or a fancy coat?) so that I can reward myself when I’ve made some progress toward weight loss goals. As fate would have it, I was set up close to Cindy of Portland’s Mystique Artisan Gallery. She and I had traded a few emails before the show, to discuss whether my work would be a good fit for her gallery. Almost as soon as we met, we realized that it certainly seems like a good fit! Robb and I stopped by the gallery the next morning on our way out of town, to check out the space and deliver a selection of masks. 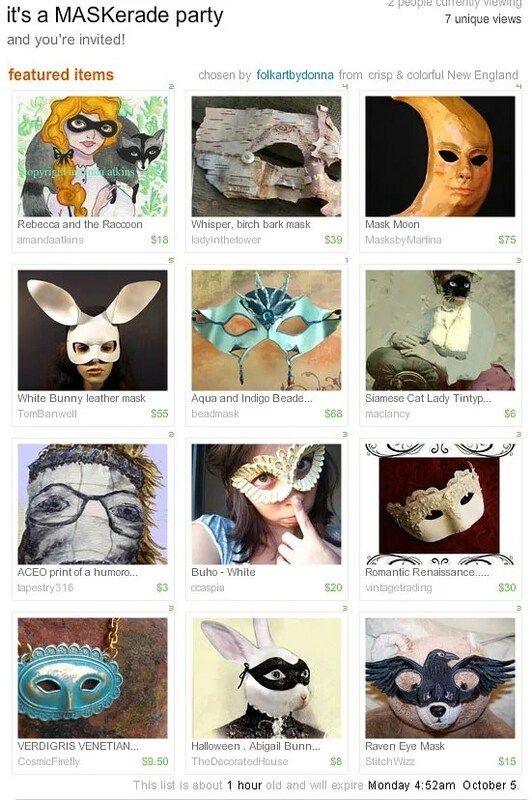 She’s got a great eye for quality, and she represents some of the most talented mask artists in the US. I am thrilled to have my work included there, and I hope you’ll stop by and say hi if you ever find yourself in the Portland area! 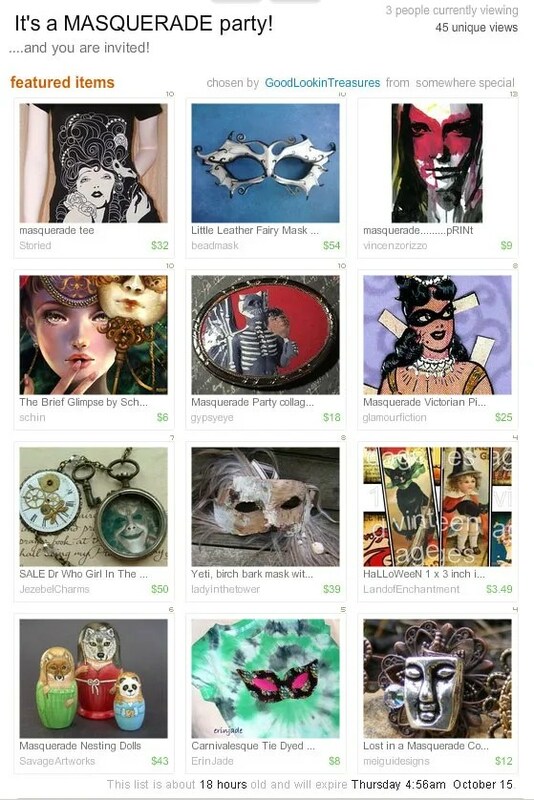 GoodLookinTreasures was kind enough to include my black and white faerie mask in this gorgeous masquerade treasury (thanks, GoodLookin! ;o) This one features another gorgeous birch bark mask by ladyinthetower and these precious masquerade nesting dolls. Lots of other cool stuff there, so be sure to stop by & take a peek before it’s gone! It bears mention that I do realize that my last few posts have simply been Etsy treasuries. I hope my readers (if I even have readers?) don’t feel like I’m “copping out” by posting these instead of bigger, wordier posts. I post them because I really do appreciate them, and I want to promote the kind curators and talented artists involved. I also do it to remind myself. It’s a wonderful ego-boo to be included in these, and sometimes I need that. In a way, I’m collecting these treasuries as a reminder, or encouragement to keep on doing what I love. I’m always honored when someone includes my work in an Etsy treasury … and I’m especially thrilled with this one. The curator ( folkartbydonna ) has such a great eye! All of the choices are whimsical, wonderful and inspiring. Check out that awesome birch bark mask, or the adorable Buho mask by ccaspia. I also fell in love with this Black Crow Farm print by the curator, Donna Atkins.